Erica De Mane is on a roll! Nothing can stop her when she uses Italy’s Best Foods! A couple of weeks ago it was lamb shank and cicerchie, this week is Latini Farro tagliatelle! This is what happens when you use the best ingredients. 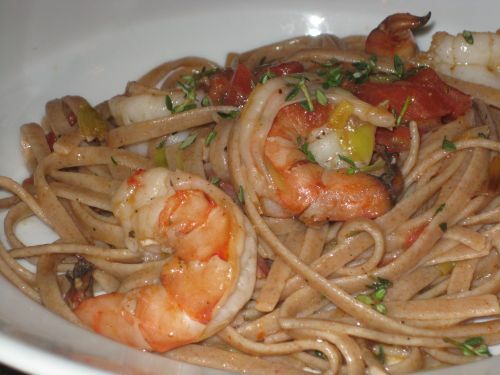 You get inspired, you create wonderful dishes, like this Tagliatelle Farro, pancetta and seafood dish, on the left (click here for story and recipe). Well, I’m inspired too. I just bought some wonderful pancetta from Brooklyn Larder. Tomorrow is Friday, the day of my local green market and I will buy Capt Rick‘s clams, mussels and squid – whatever he has. I am good with the pasta, with a full warehouse behind me, where I sit. Will report. Can’t wait!!! Previous Post Not Just Dry Figs! These are DOP Dottato Figs from Cilento. Next Post Bella di Cerignola Olives – Read the Label – Too Much Iron, No Good.